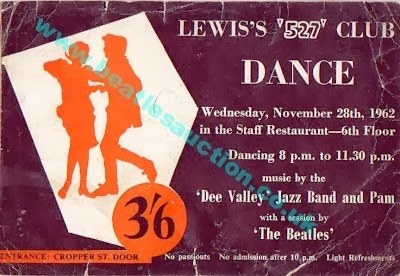 Beatles Concert tickets were, more often than not, discarded at the time, making them desirable among collectors. Tickets were often collected at the door of venues, or the stubs were thrown away after the concert as they were no longer needed. 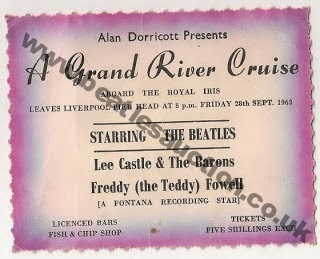 Over the years we have sold some very rare examples of Beatles concert tickets in our annual Liverpool Beatles Auction. Three of the rarest are shown below with the prices they reached. 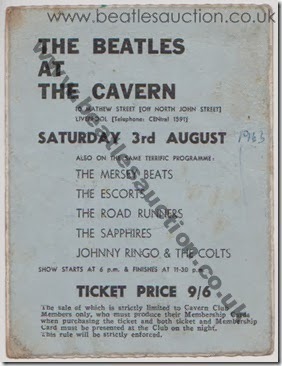 Even tickets for ordinary Beatles concerts have a value to collectors. These tickets for shows at the Liverpool Empire in 1963 were auctioned in 2011. The Tommy Roe/Chris Montez ticket sold for £240 and the other two reached £220 each. If you have any concert memorabilia - tickets, handbills, programmes - that you would like valuing please feel free to get in touch. The link to our contact details is below. Valuations are completely free.